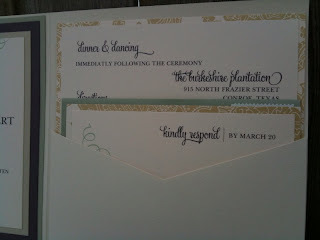 I'm doing a little backtracking because we have many invitation suites that we have done over the last few weeks that we haven't had time yet to share with you. 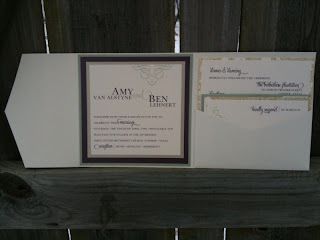 One such stunning example is this suite we created for Amy & Ben. Amy ended up being very torn between 2 of our designs: the ever-so-popular Tree of Love design and our Flirty Flourished design. To help her decision, we created 2 mockups for her using these designs in her colors. They both turned out great but the Flirty Flourished stood out as the clear winner in my eyes. 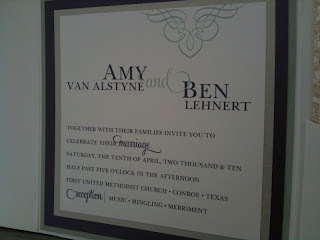 Amy & Ben agreed and we went forward. They turned out so beautiful. "Elaine was absolutely great to work with! My invitations turned out absolutely beautiful, I didn't want to mail them for staring at them! 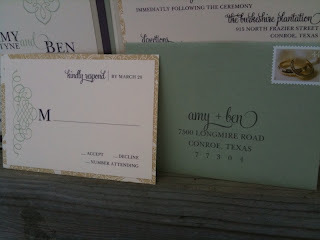 :) I love them so much, I'm having thank you notes and programs made by Sugared Ink in the same theme/colors." Really like the consistency of keeping the same font on the address label. Also, LOVE the stamp. Did you pick that out for her Elaine?